There are so many things going on in my head about this trip (and life in the short-term in general) so I’ve laid this post out a little differently but I think still coherently. To think, the part I was most worried about before going was the flights. It was easy when E was four months old and slept through everything. He was wriggly and had a meltdown when he was nine months old. Somehow I made it to SF and back when he was 13 months old and NPY has been along for the ride for the flights at 14 and 17 months. I didn’t think I was used to it anymore! As mentioned in a previous post, while E is under two years of age and thus Infant in Lap, I have to select my flights carefully taking into consideration departure time (not to early to make it hard on everyone, not too late to make it hard on E), a large enough aircraft that has a bassinet option, and price. I completely forgot about flights occurring at nap time or – worse – still being at the airport but about to board when nap time came around. On three of the four flights, E napped so happily in my arms for two hours at a time it significantly helped me pass those two 4-5 hour cross-country flights. Fortunately, he seems more comfortable sleeping as a 21mo toddler held by me than he was at 9mo, and we seriously lucked out with snagging the bassinet row both long legs. Bonus: on our last flight, on our way back to Vancouver, my neighbour in the aisle seat disappeared before take off so we spread out to his seat and we were in the bassinet row. That’s like [$300 (one-way fare) + $112 (bassinet row seat)] x 2 seats for the cost of one seat (which was an Air Miles redemption). My neighbour to the right (also a middle seat in a 2-4-2 aircraft) also benefited because we could all nap and lean into my original seat! Anyone who knows me knows I love flying and my enjoyment was significantly diminished during some flights I’ve been on with E in the last year but this set, with him restless but manageable and so interested in everything, was enjoyable again. My Halifax to Toronto leg was with Westjet and I had such a positive experience and E was so cozy sleeping on me, I had to Instagram it. I might refer to “plans” I make because I simply cannot exist without making them, but these days, I know hardly anything will go my way anymore, especially since my way tends to be jam packing the day with activities! That trip to Halifax and Toronto was difficult in so many ways so I was looking forward to this solo trip. I didn’t have to worry about keeping NPY happy content and consequently ignoring E making a connection to my parents. This time around, four months later, E is more grown up yet again. He is smarter about his limits and abilities and just as – if not more – restless. He was still going to tumble down the stairs but these days because he thinks he can walk alone while holding the bannister rails. He could concentrate on this funny lady who is trying to amuse him. He is easier to amuse and more interactive so that also drew my mum out of her shell to be willing to be led to dance and swat at bubbles with him. 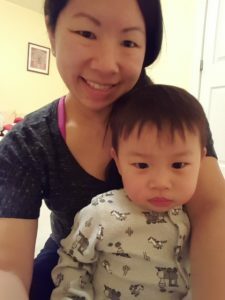 E took to her quickly and tried to address her as poh-poh (婆) but it came out as a mix of what we call him boe-boe (寶, treasure) and poe-poe (Cantonese for carrying). 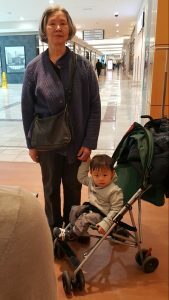 When we went to the mall, he insisted on holding her hand while being pushed in his little stroller. E and I were the first people to play in our parents’ sloping and unlandscaped backyard and we took advantage of the crazy high ceilings when playing with bubbles and tossing the giant red gym ball. As in previous solo visits, E got to sleep on a twin mattress we set on the ground next to Lil Sis’ double bed. He’s more accustomed to sleeping close to the ground these days now they have transitioned him out of the crib at daycare and Grandma T – I think – naps him on a mat because he’s too heavy for her to lift. 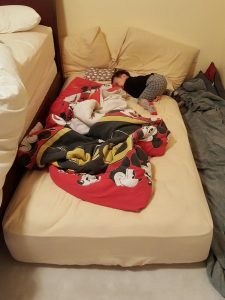 The twin mattress is more plush than a mat and E seemed thrilled to be able to climb into bed himself and would eagerly burrow himself even when it wasn’t nap- or bedtime. NPY is angsty about me traveling with E alone. He reminds me to watch E really carefully because of the new environment and because I could be caught up chatting with my sister or friends. NPY worries that when traveling, E tends to get sick from adjusting to different (colder) climates and he doesn’t eat enough. Yes, his food intake took a dive. But E gets noticeably smarter with travel. 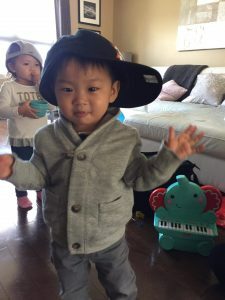 I firmly believe it accelerated whatever he was coming to and while we were away, he started saying two-word phrases (finally) like “mama sit” and “mama hand”. I’m disappointed it’s not in Chinese but he understands it when I respond in Chinese. 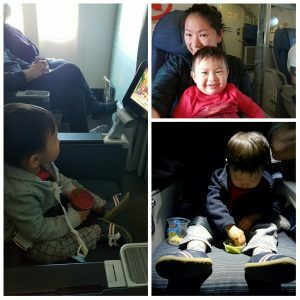 I was also looking forward to him being immersed in Chinese for the nine days we were away – no daycare, no English-speaking relatives. At Lil Sis’ he got accustomed to scaling up sofas (finally) and even opening doors with handles. I wonder if E understands that he flew in an airplane in the sky and how long his memory about people and things lasts. Right off the bat, with my first Air Canada flight, I knew that my checked baggage was at the maximum (23kg). I was going to shed some weight with using up diapers (barely), some food gifts for my mum and using up some prepared food for E. Still, I couldn’t go shopping. By the second day, I thought we were on Central time zone, halfway between Atlantic and Pacific, but then we tended back to Pacific time zone. At the expense of a few hours of sleep, E seemed otherwise resilient to the time zone changes napped consistently between 2-4 p.m. After he woke up from his nap, we would go “shopping”. Inclement weather in each city and not being in walking-friendly neighbourhoods, I would pop him in his car seat – which he was more cheerful to go into this time – and drive somewhere, even if it was a grocery store. In Halifax, we visited Nine Locks Brewing (got the tasting glass I wanted since Christmas), Sobeys, NSLC (liquor store, because it’s adjacent to the Sobeys), Atlantic Superstore and its Joe Fresh on a separate day, and Mic Mac Mall. With my parents’ work schedule and I was only in Halifax over one weekend, we were just going to squeeze in one lunch together. We already tried the great places like EDNA and Coastal so it was time to try out Ardmore Tea Room which has been on Quinpool forever and is a constant on those “Where to brunch lists”. My parents were very uncomfortable sitting side by side retro (and retro-sized) booth seating because while they are not large, they also feel that it is a narrow fit. Daddy ordered an eggs Benedict which I would think the establishment churns out a lot of, Mummy ordered fish which I think they prepare less frequently, and I ordered Atlantic fish cakes (made with salted cod), a breakfast item with two eggs. Salted cod fish cakes are what they are and I couldn’t amp it up with hot sauce, garlic flakes (barely) or runny egg yoke. Worse yet, I didn’t think the eggs were well prepared and that is not something I can let slide. Although a meal at the Ardmore is not very expensive, it still didn’t feel worth it. 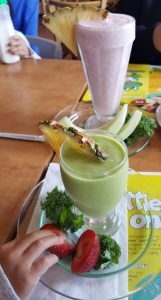 The only other dining out I did in Halifax was at Cora’s in Bedford when I met up with Thuy. It’s not new to me and for old times’ sake, I was keen to go. 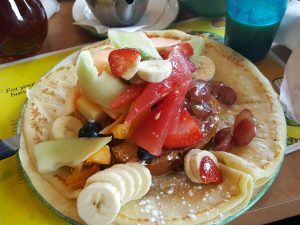 The are well-known for their mountain of fruit that accompanies many of their breakfast dish and I thought I made a savvy choice with the Seventh of July which has both crepes and waffle – also more variety for E who ended up refusing most things offered to him that meal. 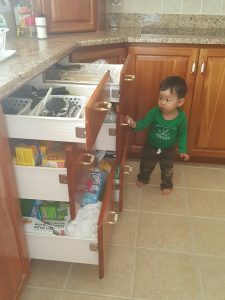 Well no wonder – the kid knows good food. The fruit was not crisp and fresh and the crepe was dense and cold. On top of that, the restaurant did not feel very clean so I was very squeamish about picking up crayons that E kept tossing onto the ground. I didn’t want to invite myself to Thuy’s – so suggested Cora’s where I hoped E would eat fruit and pancakes (no such luck). Little Chloe was sweet and ate but both kids got restless after 45 minutes of being in high chairs. Since there was still quite a bit of time before she had to pick up the older kids from school, she invited me back to her house and I do admit that things went much more smoothly once E had new toys to play with. Thuy and I met up when E and Chloe were four months and nine months. I didn’t check in with them during the Christmas visit so I was eager to this time, also because I don’t know when next I will be back in Halifax. Thuy and I could really get caught up and the kids got their social time and that is what matters. Plan: To run (who are we kidding, I only jog these days) 5K around Citadel Hill and and access some restricted areas of the fortress that only use runners get to see/run through. Actual: Not so much. At least I made it to the race as opposed to not at all. E was a real trooper waking up in a different house than the one he woke up in 24 hours and didn’t fuss when less familiar grandparents minded him for an hour and I wasn’t present. Otherwise, it was a bad race and that is why I have been loathed to blog about it. On our last day in Halifax, I brought E to the Dartmouth waterfront because that’s where you want to take pictures, of the Halifax skyline and Macdonald Bridge on the north end of the photo. As the clouds moved and it became a sunny afternoon, E watched the ferries come and go – he was fascinated by a couple of spinning components atop the vessels. We stayed on the waterfront because I was too cheap to pay for parking and ferry fares. And I was watch the time and concluded that E didn’t really want to go out and back and all the waiting in between (really, it was I who didn’t have the patience). But we will next time! The shot I wanted that is from under the bridge and showing its size and majesty, I got from Shore Road and parking illegally. Next time, as well, I will return at night to take the same shot with the bridge’s lights on. Actual: Since Lil Sis has heard it from me so many times, she laughs at my attempt to go to the Bata Shoe Museum. Needless to say, it did not happen yet again not in small part because my flight was delayed by over 90 minutes. There was coincidentally a CBC article that day about the widespread delays. Lil Sis was working from home that day and was able to pick us up and we had a chill evening and had Thai food for dinner, delivered. Plan: Head downtown and hit up Pot Belly (sandwich chain from Chicago), Sam James (siphon coffee), Tsujiri (matcha parfait), Muji (toothbrush holder and now I covet their Kleenex tissue holder), Umbra (for entryway coat hooks), Pokito (poke! ), and visit our Toronto cousins with kids. Actual: Hah! We head out early for Lil Sis’ dress fitting at the David’s Bridal in Mississauga. It took over 90 minutes just to get pinned up and her instructions conveyed. I didn’t quite know what to do with a car downtown but it also felt late to head out downtown by TTC from the apartment. Lil Sis – who took the day off work to spend with us – asked what I had planned, remembered how I mentioned Pokito before and we head in. It started to rain heavily because rain really was following me around the city so I changed my mind about Pokito (didn’t know where we could park on Queen West) and directed us to Rasta Pasta which in Kensington Market, had better parking options. Sort of. Last visit, we thought about swinging by Rasta Pasta after some shopping at the Eaton Centre but they closed at 7 p.m. and we didn’t make it on time. Lil Sis and future BIL even looked at the menu and conveyed their order to us. We made it this time and found 30-minute parking just outside. We were just going to eat in the car. Rasta Pasta is two neighbouring shops. 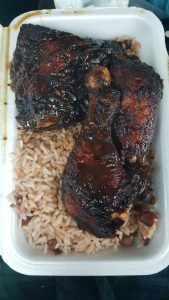 One serves up meats like jerk chicken and ackee fish. The other serves their Italian fusion (pasta) dishes and paninis so I went between the two shops to get jerk chicken and pasta with jerk meatballs. Delicious, and the jerk chicken was well worth the price. We didn’t really know what to do anymore considering it was raining, we had the car downtown, and it was already 1 p.m. We drove back to Yorkdale Mall near Lil Sis’ apartment because it is a grand and wonderful place with a new modern parking garage. It’s just a mall but it’s a mall with Muji and the pop-up space was hopping that day. It was too bad we already had our sweet coffee drinks – and Lil Sis got to observe the mayhem that is Frappuccino Happy Hour starting at 3 p.m. The pop-up space that day was hosting Uncle Tetsu (from which we got a cheesecake and half dozen of truly delicious tarts), Eva’s Chimney’s (long line-up and we were wondering as we saw people wandering through the mall with delectable looking ice cream cones), Pie R Squared and some other shop that was just watching all the spotlight to go Eva’s. (In fact, we missed by a couple of days a super-special collaboration between Uncle Tetsu and Eva’s Chimney’s.) Great minds think alike and our cousins also had Uncle Tetsu cheesecake for dessert! It was a lovely visit with cousins at their house. Their older kid is really inquisitive now and the younger is just 11 months older then E so a bit of what I have to look forward to! Plan: My first visit to Leslie Spit from which people take gorgeous photos of Toronto and capture some engagement-style photos of Lil Sis and her fiance, indulgent brunch at Yaya, visiting the Shops at Don Mills, dinner from Rasta Pasta which was thwarted by bad timing last time, and see Vinnie and Junior. Actual: We left the apartment late to go for brunch, like at 11 a.m. and immediately hit traffic. The Allen was closed or something and every other street east and west was backed up. I told them we could go anywhere else but future BIL set aside the day to spend with us and I suggested a restaurant in Leslieville and we were going there! They are otherwise somewhat homebodies these days. 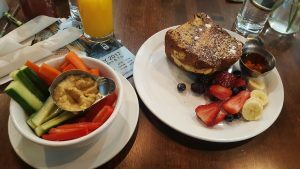 I read about the stuffed French toast at Yaya (BlogTo, where else) and it turns out they are not only a “farm fresh” establishment but also kid friendly with a considerately compiled kids menu. I got E some hummus which he happily sucked from the vegetables for a while. My stuffed French toast was divine. Oh, E also liked the vanilla bean ricotta from my French toast because who wouldn’t? Since we were in the city, future BIL wanted to check out the sake shop in Distillery District. I was more than happy to go there because it’s a beautiful area and I could get those engagement-style photos if they were willing and they were! We battled more traffic to get back to the apartment – still as a result of the Allen being closed and I was feeling so worn after that ordeal I was reluctant to leave the apartment and battle the traffic alone. It’s nice to know that I will be back in less than seven weeks and Vinnie and I – who see each other usually just once per trip – will simply have to see each other twice next time, when I’m there for ten whole days. With Lil Sis often passing out on the couch watching television and some topics to wade through, future BIL and I had some real conversations this time around. After a long and difficult phone call with Daddy, I filled future BIL in on our family drama that is causing wedding drama. Lil Sis would have told him some background about our family but she would have a different slant on it than I have. Future BIL told me about what his family is going through and – honestly – that should put our drama into perspective. The next evening, I tapped his brain with some detailed questions about divorce and property a couple owns (he’s an expert) – asking about a friend, honest! – and I wondered if I set some speculation in motion as a result. Best yet, future BIL told me something about the timeline of their move to Vancouver, something Lil Sis hadn’t really divulged and I couldn’t be more excited. Well, cautiously excited, as I need to be. 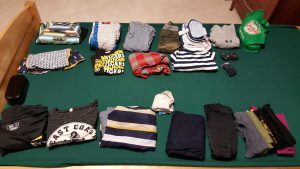 After all of these trips with E where I find some kind of satisfaction laying out little stacks of his clothes on the sofa before putting them in the suitcase, I finally came up with an efficiency. When I pack something like three sleepers, four long-sleeve onesies, four short-sleeved onesies, etc., I am now folding clothes of the same category together. Then I have three bundles and not 11 separate clothing items. It made keeping his clothing tidy in the suitcase easier, too, because I would peel off a layer of a bundle but the rest would still be coherently grouped!